McGoldrick is the highest scoring Ireland international in the Championship this season. 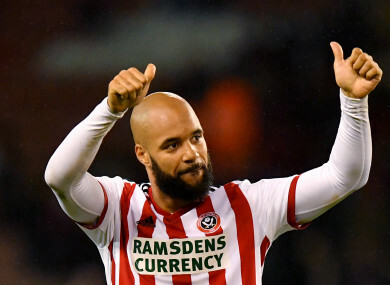 A SUCCESSFUL SEASON in front of goal continued for David McGoldrick on Tuesday night as the Ireland striker scored his 12th Championship goal of the season during Sheffield United’s 2-0 defeat of Brentford. Oliver Norwood put the Blades ahead from the penalty spot just before the half hour mark, with McGoldrick making sure of the three points six minutes from time from close range. The striker was named in Mick McCarthy’s provisional 38-man squad for Ireland’s upcoming Euro 2020 qualifiers away to Gibraltar on Saturday week and at home to Georgia at the Aviva Stadium three days later. So far this season McGoldrick has been in fine form, finding double figures for the second successive campaign at Bramall Lane since joining Sheffield United from Ipswich last July. Tuesday’s strike was the 31-year-old’s first goal in five games — his first since the start of February — with many expecting the striker to enjoy a more prominent role in the national team under Mick McCarthy, who he worked under for five years at Portman Road. He made no appearances for the Boys in Green last year as Martin O’Neill favoured other attacking options throughout the Uefa Nations League, with McGoldrick last lining out for Ireland during a friendly against Mexico in June 2017. Email “McGoldrick scores 12th of the season for Sheffield United as Ireland internationals draw near”. Feedback on “McGoldrick scores 12th of the season for Sheffield United as Ireland internationals draw near”.